Breathe life into an expansive but somewhat neglected garden in order to move it towards being as productive as possible. As Blitz #2, it was seen as building on the momentum of Blitz #1. 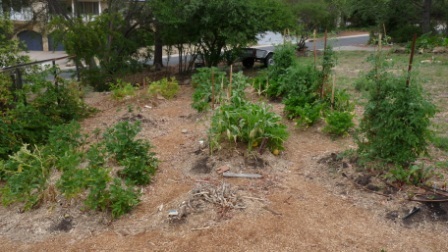 · Install a vegetable garden on what was left of a previous vegetable garden. · Great lunches both days! · Finally confirmed site for chook pen after much discussion and research. Warren and Anne-Maree volunteered their garden for a blitz in October 2009. Warren and Anne-Maree were asked to kindly keep details of their journey with the PermaBlitzACT team, which evolved over a few months, culminating with the PermaBlitz happening in mid October 2009. Angus (19), Siobhan (17) and Hamish (14). In our 21 years of fairly nomadic married life we have lived in 12 different homes in 3 different states plus a couple of years in the UK. We have long harboured the desire to explore a lifestyle in which we could reduce our 'footprint' on the earth through establishing an attractive and productive garden. Flicking through the pages of our treasured Earth Garden magazine both inspired us and frustrated us as we thought that establishing a permaculture garden was all just too hard. Too much to learn, too much to do, too much conflicting advice, and we'll be leaving soon anyway. We had lots of excuses until we met Alison Stewart at the Canberra Harvest Festival in March of 2009. Her obvious passion for permaculture captured our imagination and we gave her our contact details on the spot. Here we are in August and in just over five months, Alison has led the formation of ACT Permablitz and we are already onto project number two, our place! Project One was a real eye opener. Ricardo and Sharyn's place. AM and I participated in some of the early planning (as complete novices) and we were part of the work team only on Day 2 as on Day 1 we were moving house. Day 2 was incredible. As a group we were a fairly eclectic bunch. But we all shared a passion for productive gardening. Novices, self-taught and experts shared knowledge, experiences, work-load and food whilst transforming a garden. It was remarkable! Imagine our surprise and delight when the group decided that a great housewarming present for AM and I in our newly purchased home would be to help us establish our vegie patch in time for thisgrowing season. However, delight quickly turned to fear. AM & I both work long hours (who doesn' these days), our three teenagers keep us 'on the hop', and the 30 year old house we have bought needs 'a bit of love'. Whilst we were excited about the prospect of a vegie garden so quickly, up until a couple of weeksago, we had no idea what we were doing. We know a little bit more now, we still have lots to learn, we still have a lot of work to do to get ready for the PermaBlitz assault on our garden, but we are not as daunted by the project aswe would have been had we ever got around to actually doing this type of project ourselves. This is where the beauty of the PermaBlitz concept in practice proves its worth. More on this in the next blog. BLOG POST 2 - Preparing for the Prep Day! Not long after Anne-Maree and I happily agreed to be the target of ACT Permablitz Project 2, Alison started visiting. Her visits were troubling for us as she asked questions which in most cases we had no idea how to answer! Lots of frantic reading of permaculture books provided by Allison and lots of kind advice from the group has resulted in us being able to feign some knowledge at the two planning meetings we have had. The excitement of having Alison (x2), Riccardo, Sharyn, Damien, Ilaria, Linda and Gillian to work with us planning our PermaBlitz is offset by the overwhelming realisation of how much preparation we have to do so that the day is a success. We don’t want to let the planning team down by not being prepared for the Prep Day on 12 Sep. Oh dear, that is only 12 days away! Prep the garden for the prep day (Sounds a bit crazy doesn’t it, a bit like people who clean the house before the cleaner arrives because they don’t want the cleaner to think that they live in a dirty home. However, our garden is currently strewn with pavers, concrete slabs, plastic sheets, a half filled trailer, a pile of branches the size of a small hut, compost we brought from our previous house [too good to leave behind], a partially dismantled fence, piles of old timber, etc, etc.) Continue with our observations around the garden. Since doing this I feel as though I have discovered a whole new world. Yesterday the camelia had two flowers, this morning it had about a dozen. What a hoot! (Can you tell I have not gardened much before?) This kind of thing is happening throughout our garden, it is a contrasting wonderland of beauty, weeds and rubbish. What a thought to finish this blog on. Have just reviewed the list of jobs I assembled for myself at Blog 2 and we are doing OK. Just OK. Spent all of Saturday and much of Sunday (got treated to a great tappas & tipple for lunch at Yarrh Winery for Fathers Day) just getting the garden to a workable state. Actually, it is a huge improvement on what we started with on Saturday morning. Amazing how much motivation the prospect of a whole bunch of people inyour garden gives you. We really wanted to be able to have lots of people move around the garden without tripping over a rotting timber fence, old bricks and pavers randomly scattered around the yard, timber randomly scattered around the yard. It was a very useful thing to do as we identified and saved a lot of things that will prove useful in the construction of our permaculture garden. Quite a bit of timber in good condition that will be useful in the chicken house construction scheduled for December, a variety of pavers that I should be able to use for small retaining walls and some additional paved areas, plenty of dead and excess vegetation that will be put through the mulcher on Saturday. All is now neatly sorted and stored and there are far less obstacles to getting around the garden. Twisted ankles etc are no fun. We are very pleased with what we have achieved this weekend, but still a little worried about what is left to do. We need to walk the ground again and confirm what we want to achieve. Having done the clean up we will be able to do this more easily. Our on going observations are helping to shape our ideas and we should be OK with this by Thursday. AM is planning to have a rostered day off on Friday so she will be able to do any last minute arrangements. We were both in the garden at 630am today and the frost was quite prevalent. Alison has been fantastic with her ongoing support and suggestions. They are good reminders of what we still have left to do. Must go now and make a proper list. BLOG POST 4 - Last Minute Planning! It is late Tuesday night and AM and I are trying to condense a lot of ideas into our plan in preparation for Saturday. We have to curb our enthusiasm for what we would like to achieve, with the reality of what is possible. We hope to be able to have lots of tasks set-up so that those who join us have the opportunity to learn by doing. Trust me, AM and I will also be doing a lot of learning. AM and I are talking so much about the PermaBlitz at our home that the children think we have joined a cult! The day before our preparation day and somehow, the time has flown by so quickly that AM and I have yet to ‘walk the ground’ together. How did that happen? After dinner, we consult the planning options developed by the planning team and head out into the dark,cold Canberra evening that is enveloping our garden. Armed with a tape measure and a torch we develop some ‘ground truth’ for the options that the team has put forward. Satisfied that we can ‘fit’ everything where we want it and having agreed on some key aspects of the suggested plans, we head back inside, to draw up our planand develop our list of priorities for tomorrow. Not knowing how many people will arrive and how difficult it will be to achieve the different tasks, means we ended uplisting far more priorities than we actually achieved. It was however a useful exercise that helped to confirm our plan. The big day arrives and I am off to an early start. AM and I have been talking about permaculture and the group so much recently that the children have concluded that we have joined a cult. Siobhan has stayed overnight with a friend in order to avoid the initiation rites that she fears may be involved in the first public meeting atour home. Angus and Hamish are hiding under their bed covers and it is only my threats that they will in fact be the first human sacrifices for our cult that manages to entice them from their semi-slumber. However, in fairly rapid time, we manage to do the final preparatory work to host the group and any extras who may venture along. Gardening tools located and centralised, refreshment locations established, lunch area cleared and organised, task list printed etc. Alison arrives early, ever ready to helpout with the final little jobs. Ricardo and Sharyn and Damien and Ilaria soon follow so we start discussing the final plan and our priorities for the day. Eager to start, we head outside to tackle the vegetable garden together. Just at that moment, Giuseppe, Michelle, young Dashiel and Banjo the wonder dog arrive. Giuseppe, a friend for over forty (am I really that old?) years has brought his family down from his farm in Goulburn as a special surprise to spend the day with us. Cally arrives not long after and becomes Banjo’s special friend for the day. The work starts rapidly with all members of the team deciding that the vegetable garden will require a big affort. They are right. Two trellises of raspberries have been left to go feral so we are reducing that to one trellis and carefully removing the other vines to give to all of the workers at the end of the day. Clearing the remaing soil of vine roots is a time consuming task and a root barrier is installed in order to keep the vine from spreading again. 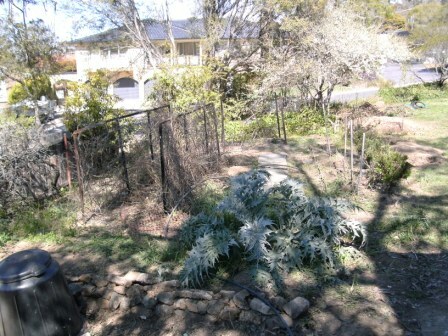 Perriwinkle is reduced along the southern boundary, the retaining wall refurbished and another weed barrier installed. All of the old reticulation is moved aside in order to give wide clearance for shaping the raised beds. Our aim is for consistently sized beds in order to be able to used the planned chicken tractor to house chickens that can ‘refurbish’ the beds forus. (Building the chicken tractor and chicken house is a holiday project over December-January). Mid morning, we greet some visitors who arrive and express interest in joining ACT Permablitz. Lunch is served as a welcome relief to the workers. We enjoy the sharing of everyone’s offerings under some glorious Canberra spring weather. Our vines oftened pergola area successfully hosts its first lunch since we became ownershere and its allure holds some longer than others as the work recommences. Since Day 1, I have tried to describe how ecstatice Anne-Maree and I feel about the success of our permablitz. I cannot, words fail me. It really is something you just have to do.Working side by side with people who share an interest is quite special. PS. Angus, Siobhan and Hamish think that the‘cult’ members are really nice folk. The sheer amount of work that the team did on Day 1 hasinspired us to make sure that Day 2 completes all of the ‘loose ends’. Anne-Maree and I review our plan and start tomake a shopping list of plants and seedlings that we need to buy. Riccardo and I have completed some calculations for; mushroom compost, sugar cane mulch,euky mulch and reticulation fittings. Day 2 arrives and we have managed to assemble all of the plants, landscaping supplies and equipment that we need. Admittedly, Anne-Mareeand I were still confirming the locations for some plants by torch light at 9.30pm the night before, but we made it! As the hosts, Anne-Maree and I ‘directed traffic’ for the day. Most teams ‘self-selected’ once the different tasks were identified. This allowed all of the ‘blitzers’ to both use their skills and learn new skills asopportunities became available. Riccardo and Steve took charge of the reticulation. This gave me a great sense of relief as I knew nothing about reticulation. (I have however since done some reticulation, thanks to this learning experience). Shovelling mulch and compost dominated the day, in addition to planting a wide variety of herbs for the kitchen garden. Once again, lunch was a highlight of the day, mainly due to the fine array of home prepared (and often home grown) delicacies assembled byall of the ‘blitzers’. After lunch we did the final planting of the seedings and afinal operating check on the reticulation. Anne-Maree and I collapse on thelounge, exhausted. The next day, we marvel at our new garden. The blitz haschanged the entire ‘feel’ of our garden. The work done by the ‘blitzers’ notonly fills us with a great community spirit, but it also gives us a responsibility to work as hard as we can to make it all work. Three months later, from our garden we have been eating and sharing: lettuce, zucchini, eggplant, tomatoes, beetroot, pumpkin, mint, sage,thyme, with more to come. Still to come are: potato, capsicum, corn, melons, a second planting of lettuce and some chillies. From existing trees we have had: apricots, plums (Green Gage and Angelina), loganberries and artichokes. We have also planted some acacias. This was ‘hard yakka’ as we underestimated how muchwork is involved in digging in Canberra soil/clay. We lost some plants due to the subsequent delays and have thus decided that in future we will ensure that we have the holes dug before actually buy the plants. We are starting to see that our garden is having a positive effect on our street. We have been able to share our produce with those who kept ‘an eye’ on our home when we had a brief holiday. Folk walking along the street stop to chat when we are working in the garden. ‘Over the road’ they admit that our activity has spurred them on to do some more work on their garden. A close friend and his wife, both accomplished gardeners/cooks, come to visit and enjoy our garden as they share tips and take some produce home. Our last ACT Permablitz Event was the Christmas Lunch on 12 Dec 09. We have missed or ‘blitzing buddies’ over the festive season and we lookforward to more blitzing in 2010. "I can't wait to follow along from a distance. What a great organization. Good luck." "I hope the first day ran as smoothly as you'd hoped - can't wait to see the pictures and join in again in a few weeks to finish the job!!"